Nisansala Sewwandi was crowned Miss Intercontinental Sri Lanka, edging out 10 finalists chosen from over 600 applications, held on 5 December at the La Belle Epoch Hotel, Mount Lavinia. She was chosen from a host of beautiful, accomplished women. She will represent Sri Lanka and will compete in the grand finale at the 2019 Miss Intercontinental pageant to be held in Manila, Philippines on 25 January 2019. She will compete for the world title against 90 international beauties in front of a sellout crowd and a panel of judges in the categories of Interview, Swimsuit, Evening Gown and Onstage questioning. The Pageant organised by its franchisee and illustrious businessman Roshan Perera, seeks to offer a platform for all women to truly empower themselves. The pageant highlighted and brought to light accomplishments made by women who challenged themselves at this event. The accomplishments focused on education, intelligence, leadership, independence, commitment to humanity, and a desire for peace throughout the globe. The pageant dresses that complimented the contestants was done by ‘Orient Design’ while hair design was carried out by ‘Hair Design Studio and Academy’ and photography by Gayan Karunarathne. The Pageant was sponsored by Akshata Suwandel Rice famed for its functional properties for glowing skin and luscious hair. The new beauty queen Sewwandi possessed an infectious personality coupled with a perfectly defined figure and adorned with a million dollar smile which won her this illustrious title in addition to winning the Miss Congeniality Award. The 23 year old beauty hails from Piliyandala and is presently studying for an external degree at Sri Jayewardenepura University while working at a leading private bank. She aspires to start her own business and join Sri Lanka’s group of young entrepreneurs.The Miss Intercontinental Sri Lanka franchisee Roshan Perera believes that the pageant signifies what true beauty personifies. Its focus for its contestants is to enhance the inner and outer beauty of modern women while they gain self-confidence and passion within themselves. The pageant period will be filled with glamour. Finalists were physically and mentally groomed, and trained. They will spread awareness via advocacy, be challenged with high fashion photo shoots, runway shows, and speeches on women empowerment. 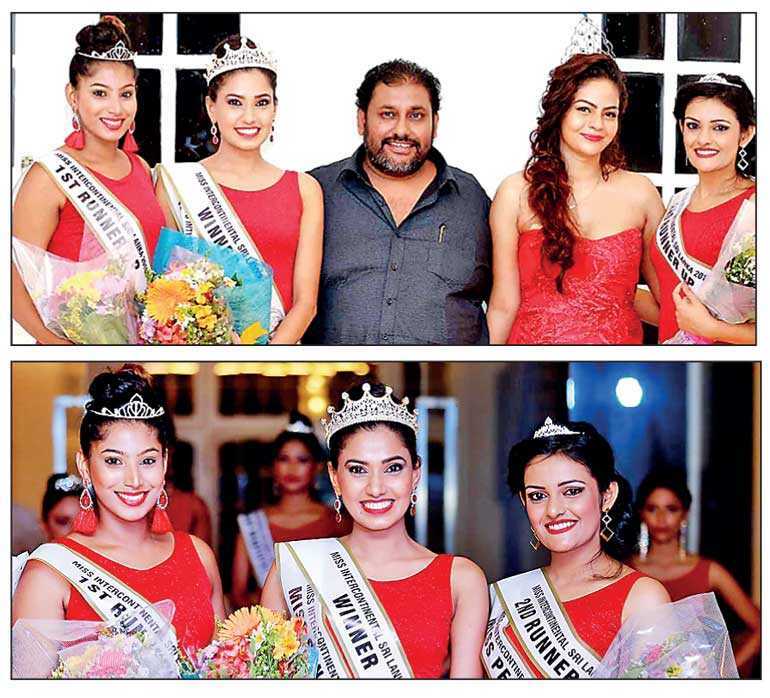 The other winners were 1st Runner-up – Chethana Ranasinghe, 2nd Runner-up – Nishala Kashali, Miss Personality – Jeewamali Rathnayake and Nishala Kashali, Miss Catwalk Queen – Vimashi Mendis, Miss Body Beautiful – Gayathri Soyza, Miss Photogenic – Vinuri Nisakya, Miss Popular – Ovini Pulara Bandara and Miss Congeniality – Nissansala Sewwandi.